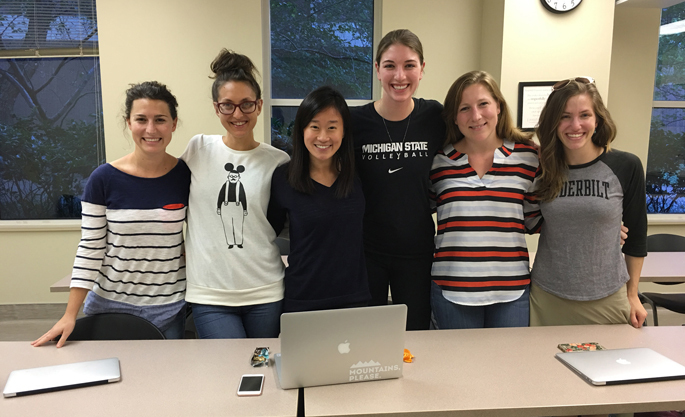 From left are Emilie Gelpi, Lex Ryan, Cynthia Tran, Maggie Halloran, Kaitlyn Breiten and Susannah Spero. Gelpi, Tran and Halloran are in the Women’s Health Nurse Practitioner program and Spero and Ryan are Family Nurse Practitioner students. Soon Vanderbilt University School of Nursing (VUSN) students interested in serving as crisis and support line volunteers for Nashville’s Sexual Assault Center (SAC) will be able to do so from any location in the country with the help of a newly developed online training program envisioned by Ginny Moore, DNP, and SAC’s Amanda Markham. Moore wondered if VUSN’s expertise in modified block distance learning, which combines on-campus concentrated sessions with online classes and coursework, could be used for SAC training. She, WHNP instructor Jessica Searcy, DNP, and Markham, who coordinates training for SAC, worked to adapt SAC’s crisis line orientation manual into a curriculum that could be delivered in a similar manner. They then teamed up with Diana Vasquez, VUSN’s academic instruction designer, to create a training program that would be accessible to out-of-town students and meet SAC’s stringent requirements. SAC’s crisis line preparation is comprehensive and challenging, requiring 25 hours of training. The crisis phone line is open 24 hours a day and certified volunteers provide frontline emotional support, practical help, information and crisis intervention counseling to people in need following a sexual assault. The nearly 40-year-old nonprofit is the only Middle Tennessee center dedicated to providing counseling to sexual assault victims, nearly half of whom are children. The inaugural class of VUSN SAC volunteers includes three Women’s Health Nurse Practitioner students and two Family Nurse Practitioner students. They expect to finish their crisis line volunteer training on Nov. 14 and can begin taking shifts as phone volunteers after that.